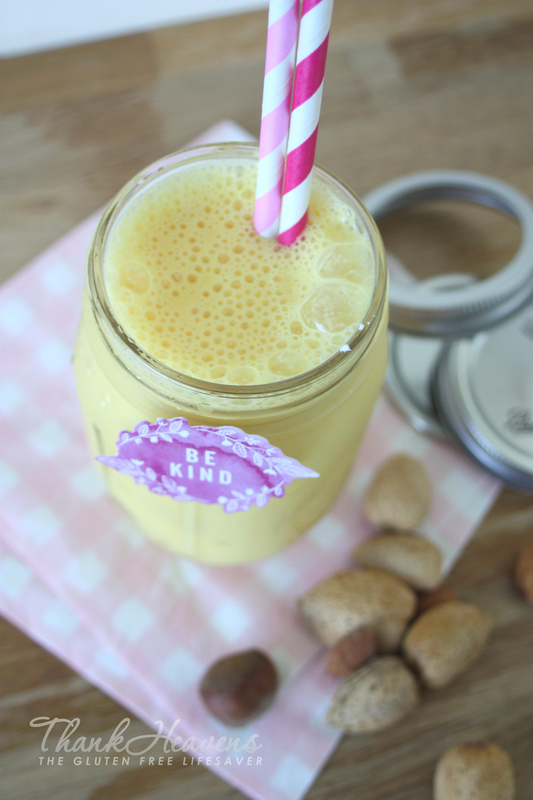 Be Kind to Yourself with an Almond, Orange & Banana Smoothie! A smoothie that will give you back that spring in your step (pun intended)! We just had the first day of spring down-under, and every day I can feel summer coming closer. Gosh I can’t wait! It’s been such a loooong and wet winter (no offence to those of you in the northern hemisphere, I know you’re cold). I feel as though it has rained for 6 months straight and I’ve had it! It’s high time to bring out the juicers and blenders again, and more than anything it’s time to get those vitamins and nutrients into your skin and begin working on your summer-glow! If you’re up north; fill your body to the brim with all the fruity goodness and take that summery energy with you into autumn! This fantastic velvety smoothie has everything you need, so go ahead and fix it up in the morning to get you started with a kick! It’s the ultimate love in a blender; it is beautifully kind to your body and your mind! Looks soooo luscious!!! And such a great idea for an end of summer treat (here on the East Coast of the US). Thanks….. Thanks Pat! It’s always a good time for a smoothie I think. It’s a treat and a health kick all at once! Here here! I am truly dying for some warmth. It takes a while for us to get good mangoes this far south but I’m bookmarking this for when we do! Before you know it stores will be flooding over with mangoes. I remember trying to put them in everything last year to make use of it all lol. This looks so delicious and refreshing! And I’m jealous of your impending spring 🙂 That’s my favorite time of year, so much promise! Though I do like fall, too. Probably because I’m a pumpkin addict. I really can’t wait for summer now. I’m craving some beach time and sun on my (all too white) skin! But yes, autumn is beautiful in its own right. And so is winter.. I do miss a bit of snow! Reblogged this on Cynthlovet3's Blog. 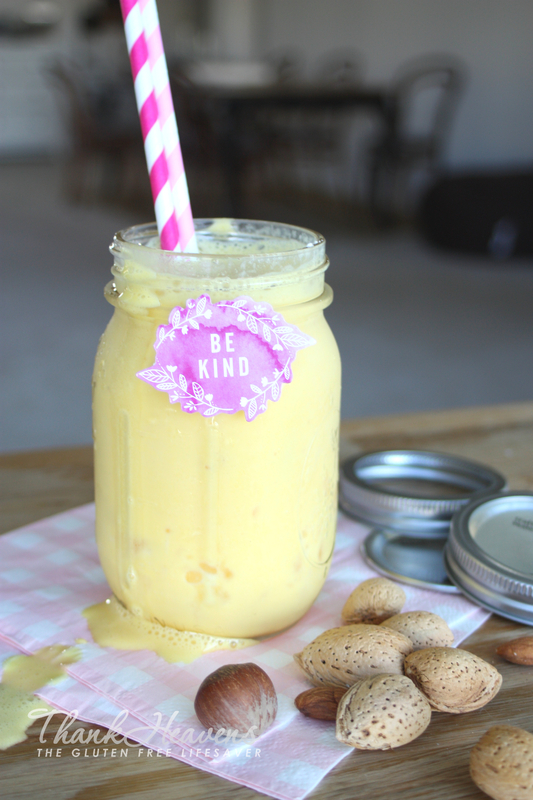 The orange almond banana smoothie looks delicious, can I use just almond milk, or is it better with yogurt? Also is there any substitute for the Mango, they are a bit hard to find in Melbourne at the moment. Will definitely give it a try. Yoghurt will give the smoothie a bit more thickness and a tangy flavour, but you can definitely use almond milk if you prefer that. You could also use soy or coconut yoghurt, or even create your own yogurt using almond milk! To replace mango you could use pawpaw (papaya) or buy fresh-frozen mango from the freezer section at the supermarket. Pawpaw has a slightly milder flavour, but because of the similar soluble fiber content to mango it will give a similar result both in consistency and nutritional values. Thank you, will try the paw paw. Do you have a recipe for Yogurt made with Almond milk, I have a yogurt maker that you fill with boiling water, and place the mixture in a lidded container, in the water, for 8 hours. I haven’t made yoghurt from almond milk myself, but I’ve tried several other milk replacers and it’s worked fine. It just usually gets a bit more runny than dairy yoghurts. You can however add some gelatine for thickness.